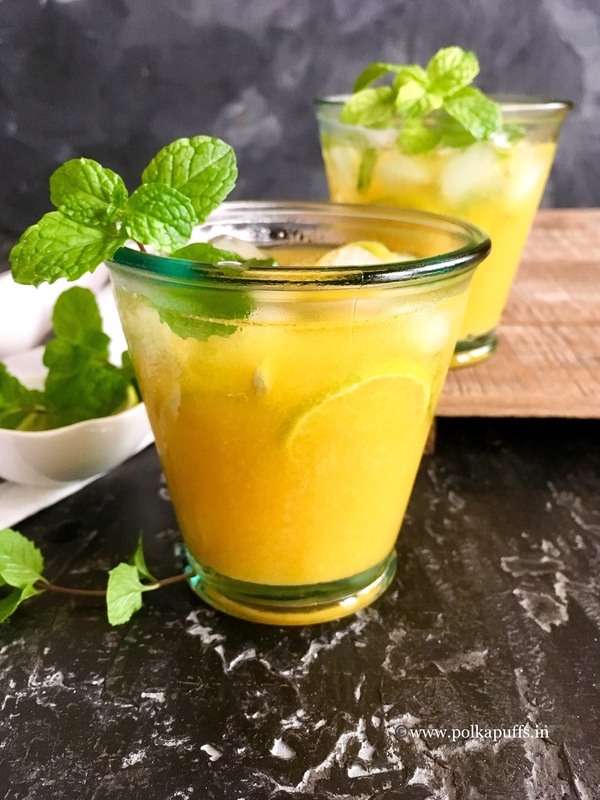 Virgin Mango Mojito | Mango Mojito Recipe tastes so delicious, I’m completely hooked! Fresh mango juice from my favorite Alphonso mangoes is the magic ingredient here in this virgin mojito 🙂 Given that this is a virgin mojito, it’s made with fresh fruit juice and carbonated water. Remember my Pomegranate Mojito?! It is still one my most hit recipes!! Even my Kiwi Mojito Pops are such a refreshing way to cool off this summer. 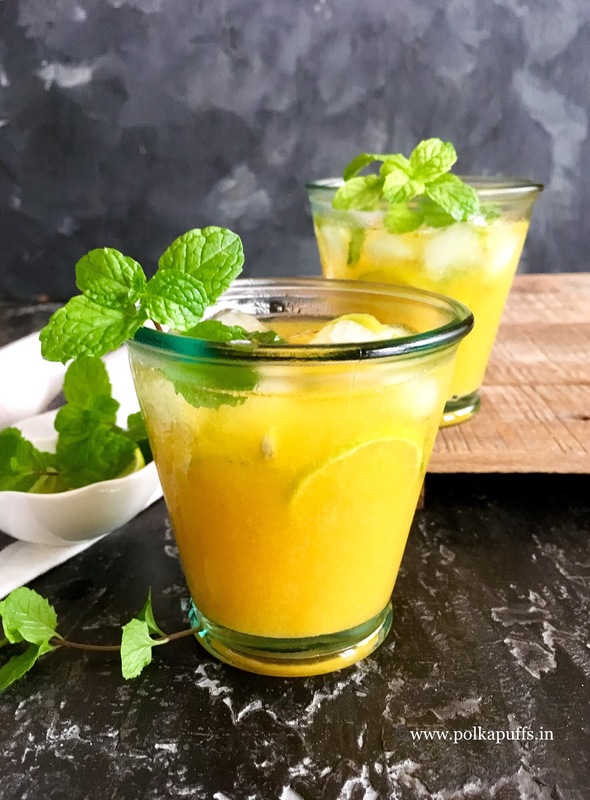 Virgin Mango Mojito | Mango Mojito Recipe was such a fad a couple of years ago when it appeared on the menus of most cafes, bistros and restaurants. It was such a phenomenal flavor and that too with such basic ingredients. I remember us ordering it everywhere we went and we still do sometimes when we’re out. 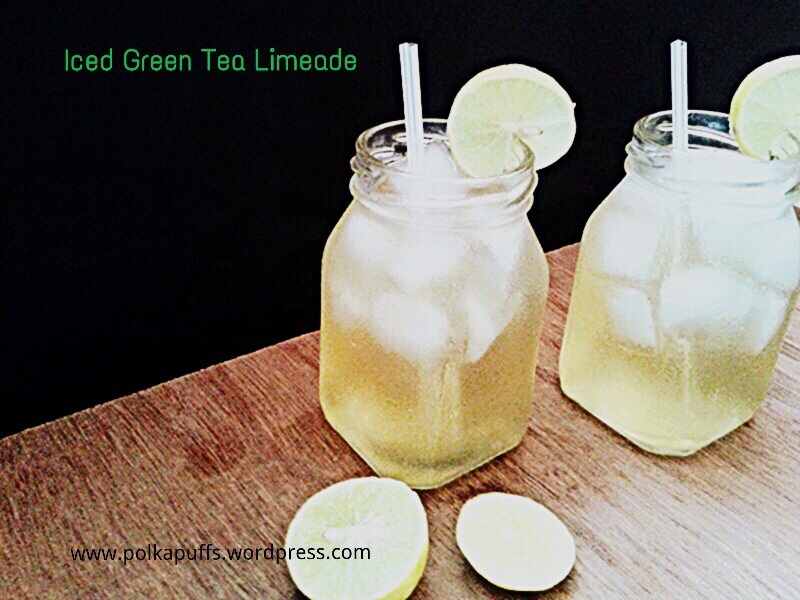 It’s very rare that a teetotaler couple manages to find a great mocktail! Since, we loved it so much, I’ve made it a few times at home and it’s so satisfying to be able to recreate this with so much ease 🙂 Fun even, muddling the ingredients and mixing a drink is almost therapeutic. A closer look?! It makes one drool right?! Lol! You should definitely try it out soon. Boil equal quantity of sugar and water together to make a simple syrup. Let it cool completely and set it aside. You can prepare this syrup and keep it handy in the refrigerator. You can use fresh juice or canned, whatever is available. I used fresh juice from Alphonso mangoes. Muddle together fresh mint leaves and lemon wedges. Place 4-5 ice cubes in each serving glass, add 2 tbsp. of the muddled mixture. Add a few extra lemon wedges and mint leaves if you like. Add the ready sugar syrup according to taste. Add 1/2 cup of mango juice in each glass. Finally, add 1/4 cup of carbonated water/ soda water and serve immediately. 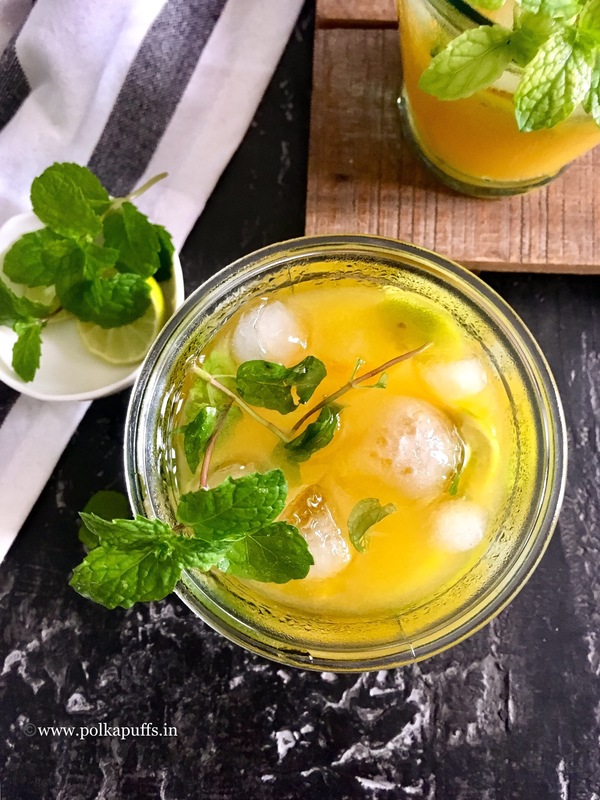 This is a refreshing virgin Mango Mojito, bursting with the flavors of lemon and mint, a more fruity version of the classic virgin mojito! It's made with everyday ingredients and comes together in minutes. This sugar syrup can be made and stored in the refrigerator for up to 2 weeks in a glass jar. Pin it here for later?!! 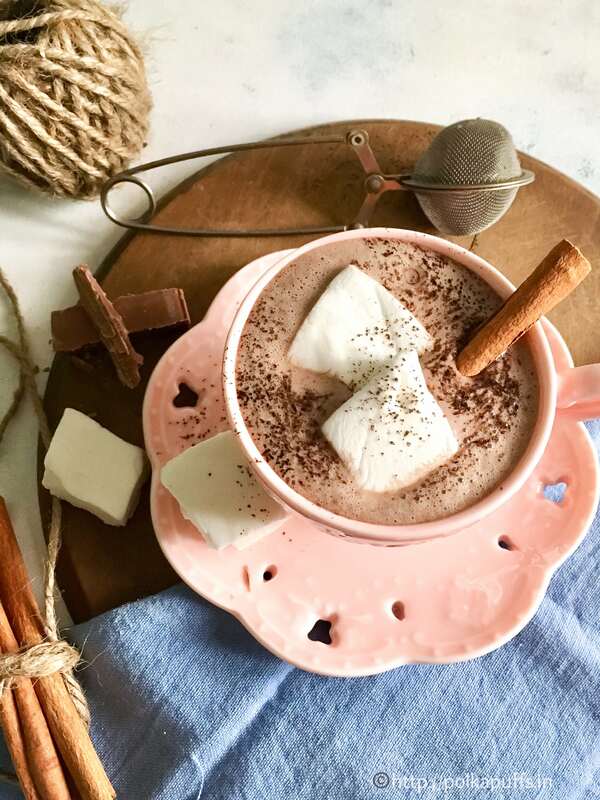 Also, the chocolate that you will into the Hot Chocolate with Homemade Vanilla Marshmallows needs to be of a good quality. I’ve used a Lindt milk chocolate bar here, you could use Ghirardelli if you’ve some handy. No, don’t use cooking chocolate here if you can avoid it. I feel the cooking/ compound chocolate takes away the smoothness of the drink. Maybe that’s just me, I don’t know! Oh and those Mini Marshmallows, you saw them in my last post. They were my best make for the year 2017 I guess 😉 They turned out better than any store bought marshmallow I’ve ever tried. I believe using a good quality vanilla extract makes all the difference. 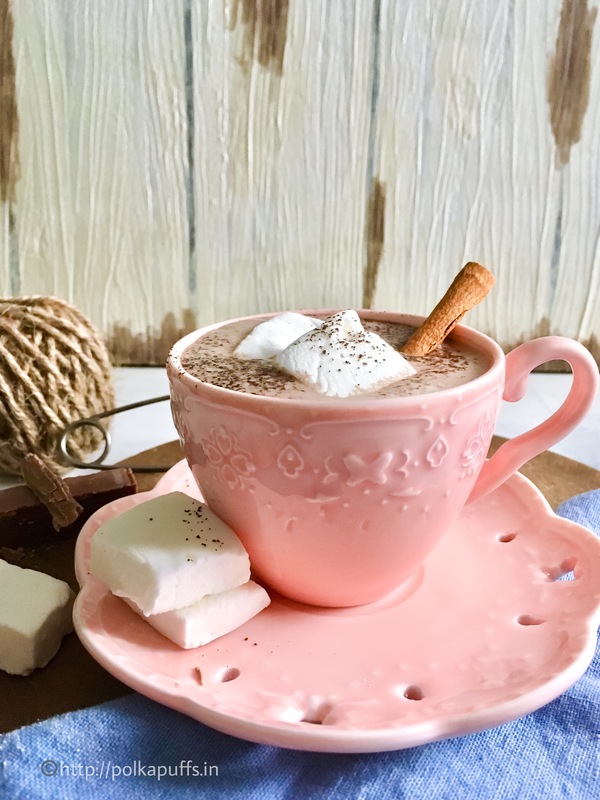 So, I topped my Hot Chocolate with Homemade Vanilla Marshmallows and I was in heaven! The marshmallows melted slowly into that warm cup of goodness. It couldn’t have been better, if I may say so myself! Bring milk to a slow boil in a heavy bottom pan. Add the cream and stir gently. Add the sugar and stir gently. Once the sugar has melted completely, add the cocoa powder. Whisk gently to incorporate. Next, add the chopped chocolate. Ensure that the flame is on sim/ lowest setting. Gently mix the chocolate to ensure it melts into the milk. Add the spices. Mix well. Turn off the flame. 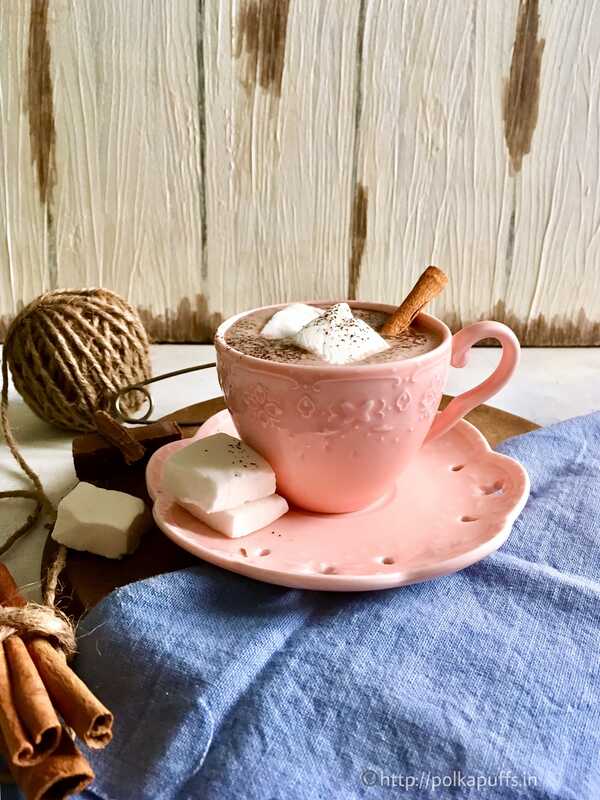 Hot Chocolate with Homemade Vanilla Marshmallows is a heart warming, cozy drink that you must make for those chilly evenings! You can dust some cocoa powder or add a stick of cinnamon. I've used Lindt milk chocolate for this as it is very smooth in a drink like this. You can use Compound milk chocolate if you prefer. Spices are not compulsory, omit them as you please. You can add more or less of chocolate and cocoa powder as per your preference. Summers and this scorching heat takes out all the energy from your body…it’s very draining! 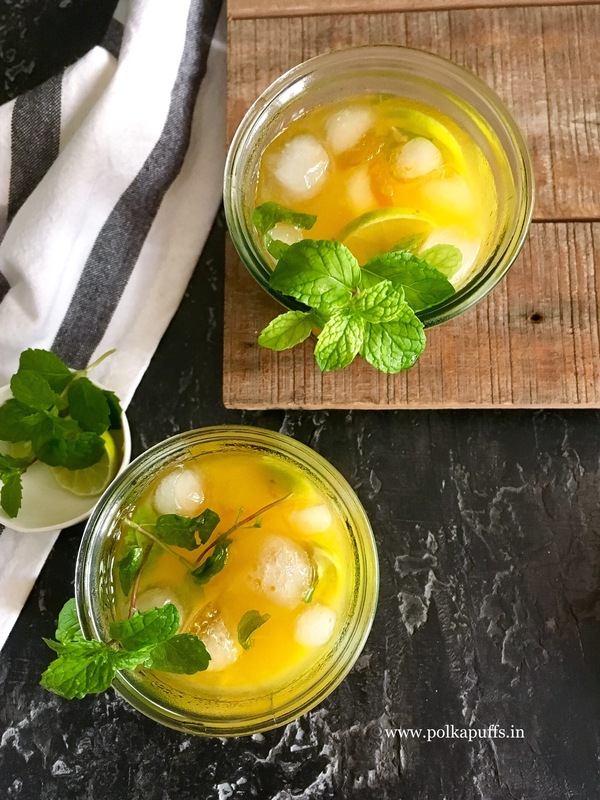 I hate stepping out in the sun 😩…I just prefer sitting at home and wait for the sun to set 😂 and sip on some cool drinks…homemade fresh fruity drinks are the best way to hydrate yourself and are way healthier than those fizzy, sugar laden sodas. Equipment: measuring cups/ spoons, a small sauce pan, a potato masher. In a saucepan, boil 3 cups of water. Turn off the heat. Add the tea bags and let them steep for about 10 mins. Remove the tea bags and pour the tea from the sauce pan into a jug. Refrigerate the tea for a minimum of 1 hour. In the meanwhile, in the same sauce pan, add the chopped strawberries along with sugar and cook them together on low heat until the strawberries are cooked well and look mushy. Use a masher to mash them as they cook. Take them off the heat. Allow the strawberry compote to cool down completely, then using a hand blender or any other other blender, make a purée and set that too in the refrigerator until you have to serve the Iced Tea. (I don’t strain the strawberry compote, you can strain it if you prefer). Add the cooled strawberry purée to the jug of chilled tea. Add some crushed ice cubes and give it a stir. 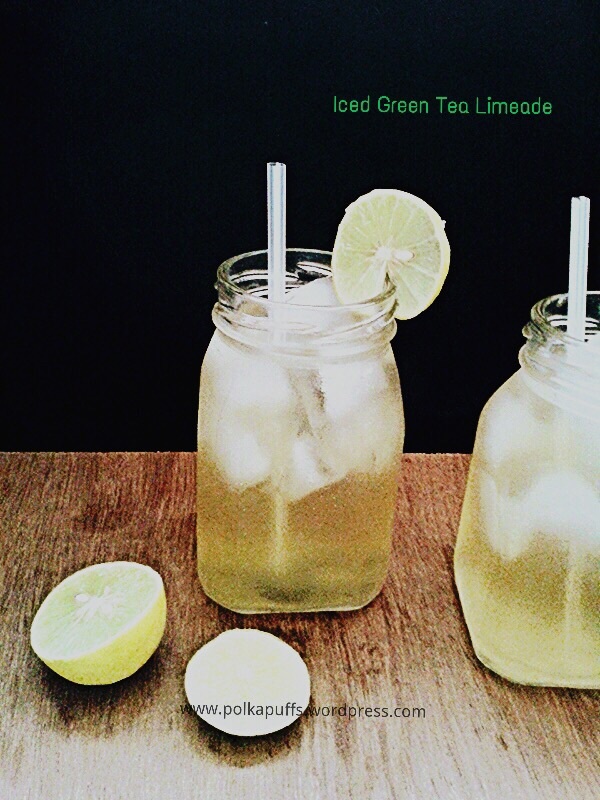 Fill your favourite glasses/ mason jars with ice cubes and pour the ready Strawberry Iced Tea over them. Place a small strawberry on the top and serve chilled! You can even add a couple of slices of lime as a garnish ☺️ Enjoy! The strawberry purée and the cooled tea can be stored in the refrigerator for 1-2 days. Place all the above ingredients in the blender and give them a go until the fruit is blended completely. Taste for sweetness and adjust. You can add more water if you like a slightly thinner beverage. Serve immediately and enjoy! This drink tastes best with the crunch of the seeds from the kiwi fruit so do not strain it. But that’s upto you! You can also place a slice of kiwi and few sprigs of mint to make it all dainty…but then again that’s just me! You’d might as well have this out of the blender jar 😜..who’s to know!? Summers…school vacations…idle afternoons…what’s a kid to do?! “Chew on your Mom’s brains”….would be my Mom’s sarcastic remark😘 Hehe! I absolutely love jamuns…their tangy, sweet and mildly sour flavour is something I wait for every summer…and these gorgeous, plump beauties make an appearance for a really short duration almost at the end of a typical Indian summer. I particularly enjoyed the overripe ones…dressed with some salt and roasted cumin powder & shaken in a vessel until most of the plums would bruise and become really juicy! Wow…I am salivating as I type🤓.. They’d taste out of the world…earthy and fresh. Wash the jamun well. Add water in the saucepan along with the jamun and sugar. Keep them to boil over medium heat until all the jamun turn very soft and mushy. The flesh should be falling apart from the seed within the fruit. Next, cool this concoction completely at room temperature. Place it in the refrigerator once cooled for at least 1-2 hours to let it macerate well. Once it’s cooled in refrigerator, mash the fruit and the syrup through a sieve over a large mixing bowl. Add the cumin pwd, salt & lemon juice to this sieved juice. Mix well. Add ice cubes and serve. This is one of the most refreshing drinks I’ve had all summer! 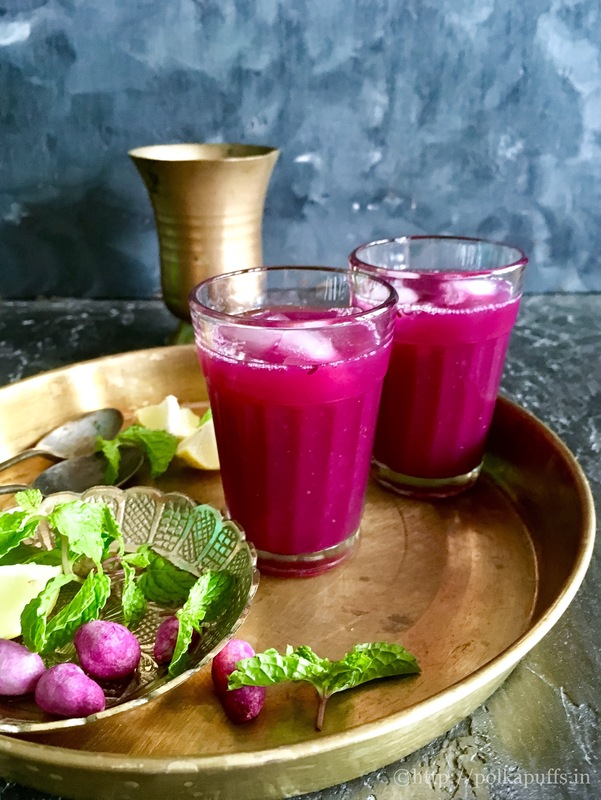 Refreshing cooler made with Indian Java Plums or commonly known as Jamun Ka Panna. Add water in the saucepan along with the jamun and sugar. Keep them to boil over medium heat until all the jamun turn very soft and mushy. The flesh should be falling apart from the seed within the fruit. Next, cool this concoction completely at room temperature. Place it in the refrigerator once cooled for at least 1-2 hours to let it macerate well. Once it's cooled in refrigerator, mash the fruit and the syrup through a sieve over a large mixing bowl. Add the cumin powder, salt & lemon juice to this sieved juice. Mix well. Add ice cubes and serve. Equipment: a blender, a saucepan, measuring cups/ spoons. Brew the green tea with warm water. Let cool down completely. Then chill this green tea for about 30 mins. Once this is chilled, add the green to the blender along with lemon juice, chopped watermelon & honey. Blend all these for a minute until everything is blended well. That’s it, add ice cubes if you like & enjoy! Now, doesn’t that look absolutely charming! I guess having something as healthy as this is much better than grabbing a can or two of cola!! 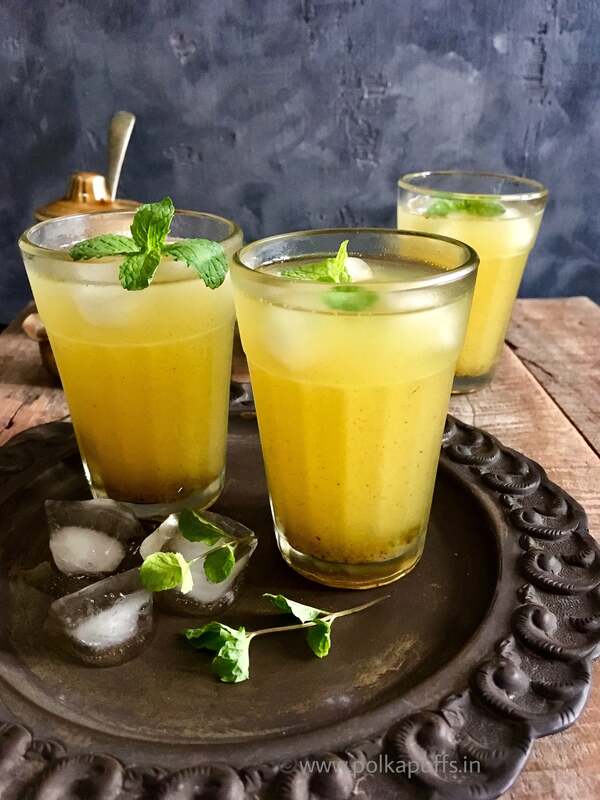 Aam Panna | Indian Mango Cooler is synonymous with summers in most Indian homes. Heaps of raw mangoes are washed, wiped dry, boiled and turned into this yummy sweet, salty & spicy concoction. 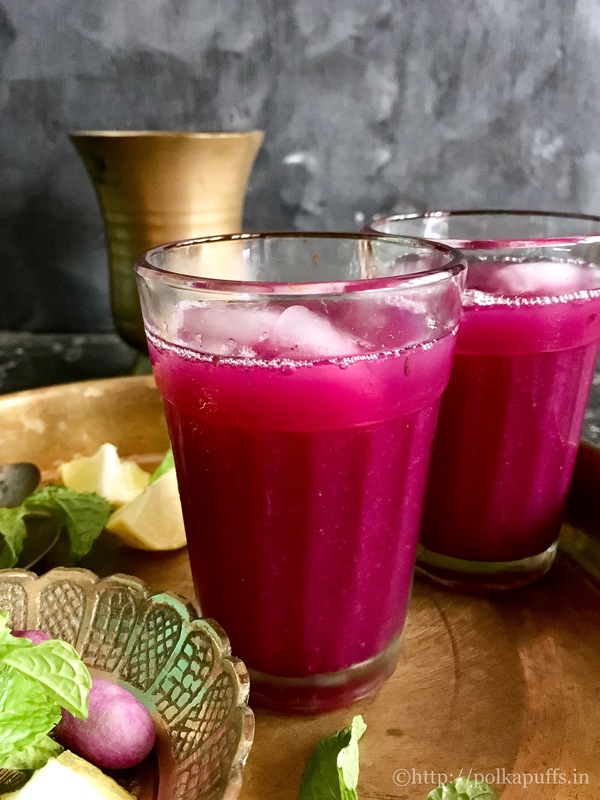 Although, it is very common, but every household has some variation in the recipe which makes this drink so famous and irresistible! 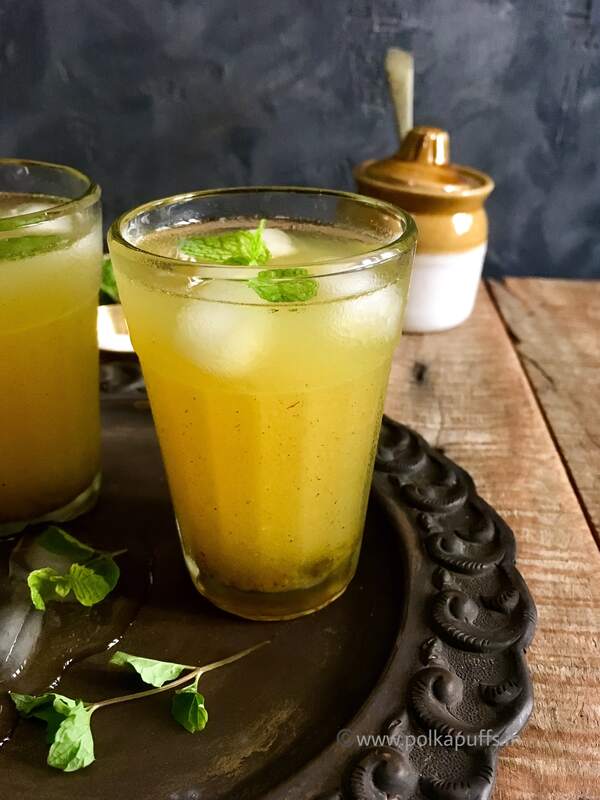 Aam Panna is famous for it’s heat-resistant properties besides being delicious! My Mom says it’s great for digestion and insists we have it daily. 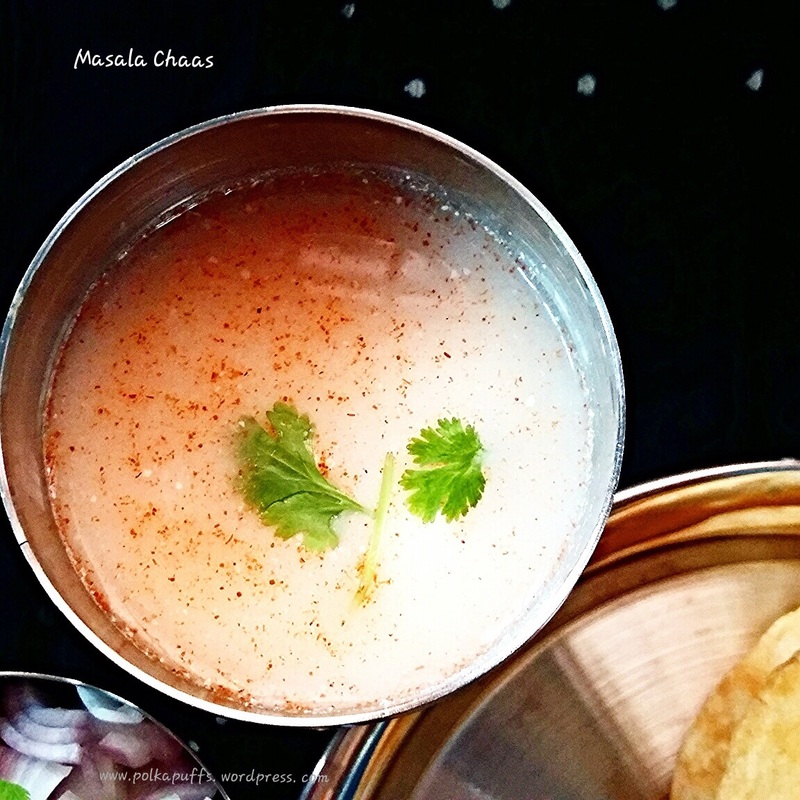 It is served as an appetizer too during summers which tastes best when served chilled! I usually don’t add ice cubes as it dilutes the flavor and the tartness of the drink but stick to using chilled water. Wash the raw mangoes & wipe them dry. Pressure cook them with 2-3 cups of water without peeling them for about 2 whistles. Let the steam release on its own. Then, once the boiled mangoes have cooled, squeeze out the pulp from the peels and the seeds. Add some water in which the mangoes were boiled to the pulp but not too much. About 1/2 a cup is enough to make the correct consistency. Then add sugar, mint leaves, Himalayan pink salt, salt and roasted cumin powder to the pulp. Purée them all together in a blender or using a hand blender. Taste the mixture and correct the salt or sugar to your liking. Store this concentrate in a bottle in the refrigerator for up to 2-3 weeks. Mix 1 part of chilled water with 1 part of the concentrate, stir and serve! 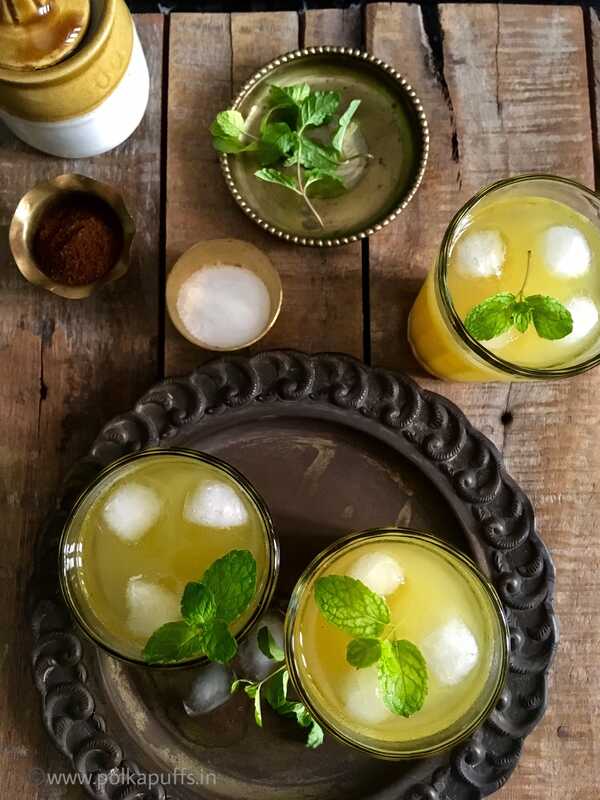 The perfect summer cooler made with delicate Indian spices and raw mangoes. A little sweetness and the freshness from mint adds to the final flourish!! Then add sugar, mint leaves, hing, Himalayan pink salt, salt and roasted cumin powder to the pulp. You can use any variety of non fibrous raw mangoes. You can choose to add more sugar if you like a sweeter version of Aam Panna. Absolutely delicious and it’s the best thirst quencher…beats a Cola for me! So, coming back to a week before my birthday…my mom asked me like she did every single year….”what do you wish to eat for your birthday dinner!? 😊😊😊😚” (I had so many things in my mind …countless dishes that I absolutely love when I mom makes them! She’s a magician! I don’t mean only while cooking…but everything…she’s got a way to make everything seem so easy for all of us. I guess that’s what all moms do for their family 💓….) …. 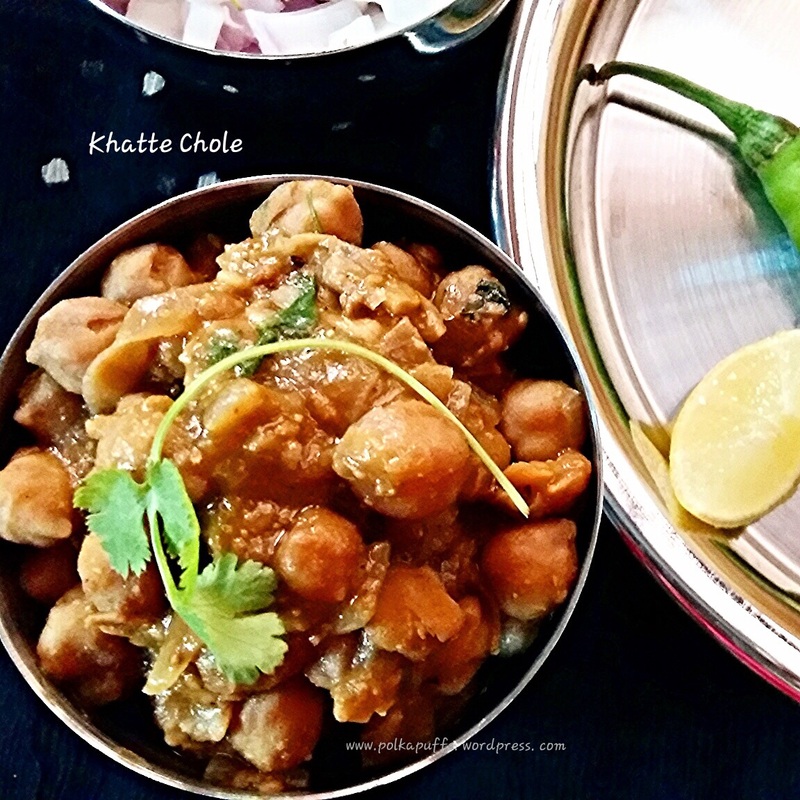 I simply said “Chole Bhature”…I didn’t really think. It just popped out of my mouth. She was like..it’s easy! Say something else. But I didn’t. I wanted her to be able to enjoy the evening with me instead of staying in the kitchen prepping for the meal! I wanted her to be there when I cut the cake 😊 …when I opened my presents which she so carefully packed for me! Simply said…I wanted her to have an easy evening and have some fun! I guess I had realised that food didn’t matter to me that evening. 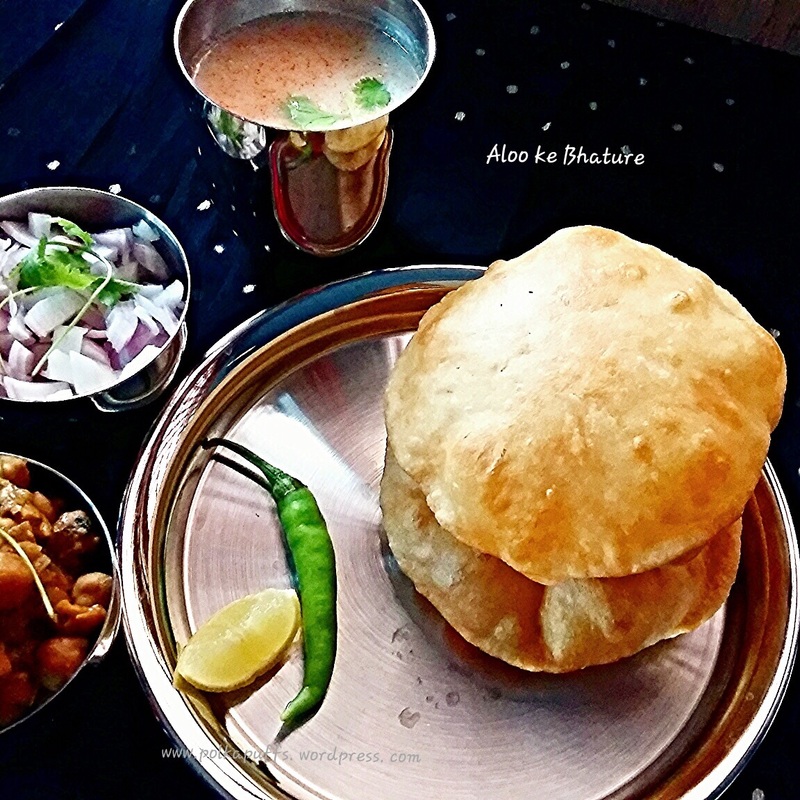 The time spent with family did… From that year, if I am spending my birthday with mom, I only ask for one Chole Bhature…it’s become kind of a ritual for me..
As I didn’t have my mom’s recipe for the Aloo Bhature, one of my favourite variants of Bhature, I called her and quickly noted everything down, deciding alongside to serve some refreshing Masala Chaas to go with my meal 😛😁..lets get started with the recipe! Equipment: a pressure cooker, a large wok, a large mixing bowl, a slotted spatula, a rolling pin, a rolling board, a few bowls, measuring spoons/cups. Next, heat the oil & ghee together in the wok. Once it’s hot enough add the cumin seeds & asafoetida (if using). Let them splutter a bit. Then, add the chopped onions, slit green chillies & ginger garlic paste. Sauté on medium flame until the onions get a light golden colour. Next, add the cumin pwd, coriander pwd, red chilli pwd & turmeric pwd. Sauté until these spices & the onion are cooked well and some oil gets separated from them. Add the drained Chole into the masala base and mix well. Season with salt but carefully as u had seasoned the Chole while boiling it too.try mashing a few of the Chole with the back of the spatula. Add a pinch of sugar. Next, add the Garam masala into the Chole and sauté again for 5 mins on medium flame. You can adjust the consistency at this point using some of the water that we saved from the pressure cooker and mix well. Also add the tamarind pulp and mix well. Cover and cook for 7-8 mins on low flame. Open the wok after that and add chopped coriander leaves and lemon juice. 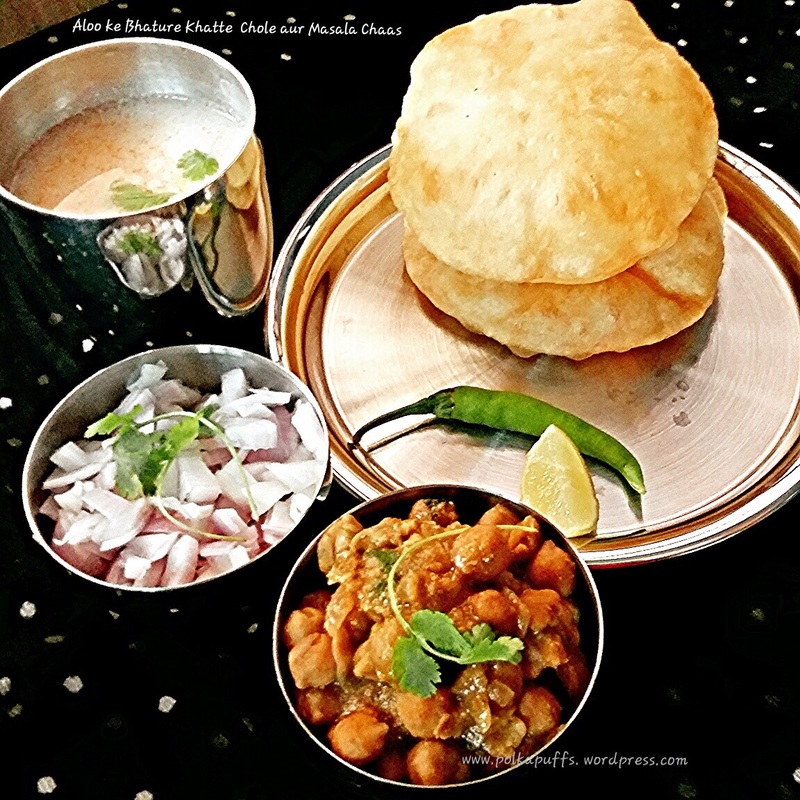 (I don’t use any ready made Chole masala, however feel free to use some while frying the onions, it’s up to you. Also adjust the amount of tamarind pulp as per your taste, I like the extra punch it gives) ☺️ serve it piping hot! Tastes great even with my Masala Puris. Now that’s what I call a soul-satisfying meal! Don’t you? Try these, you will end up making them often….